Jun Amanto×KURI　バリ島〜ジャワ島公演　／　Performances in Bali- Jawa Island in Sep.
Why don't you come over a beautiful Island,Bali...? : Please contact below,then you will get more information how to get to Sarasvati Pavilion ! HOU (dedication to god) and ZEN (the way of meditation in Buddhism). 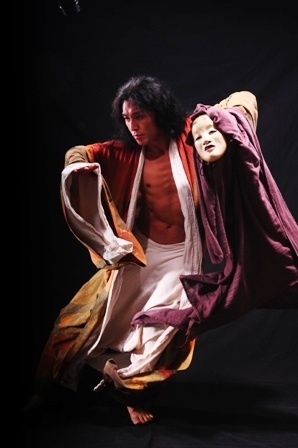 Technically speaking, he focused on Japanese traditional physical movement as Soujiku(= biaxiality. Dance using 2 centers in body.) and other systems. He seeked for Japanese original movement and found the same style in island people of Pacific Rim countries. He kept researching for the physical characteristics in maritime people and organized the consiousness and skills all together. ＫＵＲＩ’ｓ　music is dedicated to the land of the mountains in Japan, where they live, as well as the landscapes they have encountered in their world travels. 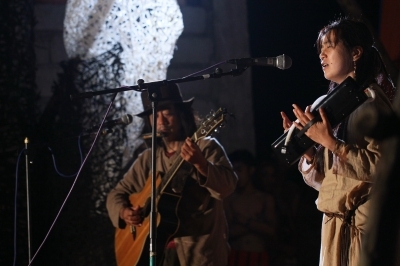 Their love of ethnic musical instruments is expressed within the duo KURI. Katsu's music crosses borders among people of all ages & cultures. After initially experiencing Folk, Rock, Noise Music, and many other musical genres, he started playing music with different ethnic instruments in the 90s. By performing concerts in many European and Asian countries he has gotten a conviction that through music people can have true heart to heart communication and overcome differences. Miho is a graduate of Kunitachi Music University in Japan. While she played in many professional orchestras and brass ensembles going on tours as a trumpeter, she was drawn to the naive tonal qualities of ethnic instruments. That yearning took her to many Asian and European countries where she experienced the power of music that was born out of the land. Her music is played with meaning & joy from the heart, connected to the land. 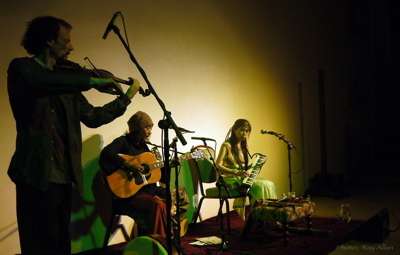 KURI with a guest musician '' Elphara'' on Violin. This concert is going to be our final concert in Europe 2013! We are looking forward to seeing you at Wild Food Cafe! We are super excited to invite you all to this very special gathering of sound at Wild Food Cafe. This time Global Resonance event is bringing a Japanese Instrumental acoustic duet which composes with the Essence of the musics of the world. 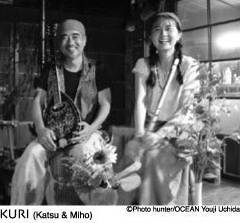 Join multi instrumentalist Katsu and Miho Mizumachi on there visit from Japan for a night of heart-opening and mind-stilling music. Kitchen is open at 7pm for one hour before the concert begins at 8pm and then again at a half hour interval. * Write more detail when we are ready. * Write more detail when we are ready! 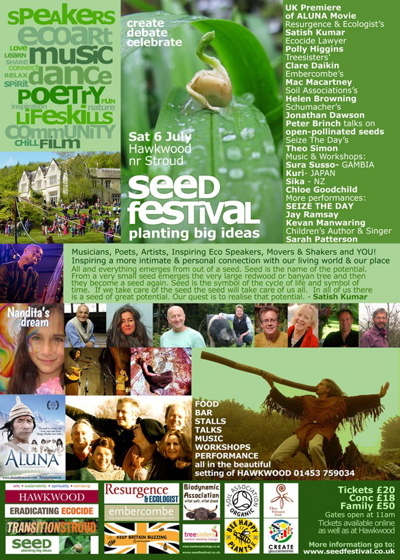 The UK's best mix of Mind& Body, Spirit, Music, Dance Festival! with KURI, a duo from Japan. Join us for our first full moon evening of 2011. The combination of ambient music and candelit gardens makes for a truly magical experience. We have the pleasure of hosting japanese duo KURI, who will be playing Irish instruments and bamboo instruments from Asia. You can listen to KURI on their MySpace page. KURI will be performing between 7 & 9pm. Refreshments will be on sale between 5 & 9pm. The shop will remain open until 9pm. The gardens will remain open until 9.30pm. Normal admission applies. Companions FREE. 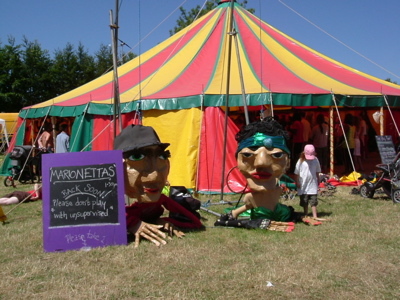 Enjoy free concerts in the 'Djanogly Concert Pitch' Monday to Saturday evenings (pre-performance) and at lunch time on Saturdays and some Sundays. Feel free to hum along, tap your toes or just sit back and listen to a lively mix of music from around the world... from cool jazz to upbeat ethnic and much, much more. ＊Foyer music is limited to Mondays and Tuesdays during the summer. On other days, weather permitting, there will be Watch This Space activity outdoors in Theatre Square. 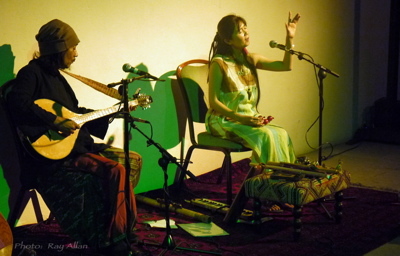 Kuri are an acoustic duet creating the essence of the music’s of the world. 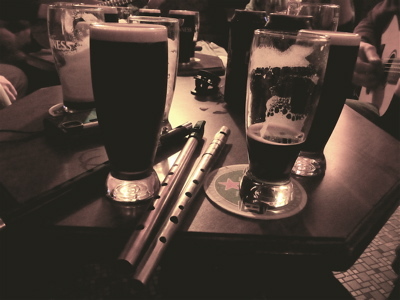 Katsu : Greek & Irish Bouzouki, Bodhran, Percussion, Jew's Harp & Vocals. His music crosses borders among people all ages & cultures. 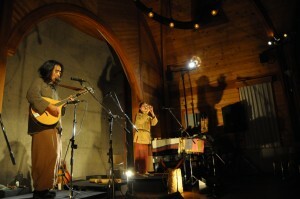 Miho : Tin & Low whistle, Ocarina, Melodion, Bamboo flute, Percussion & voice. Her music is played with meaning & joy from the heart,connected to the land. 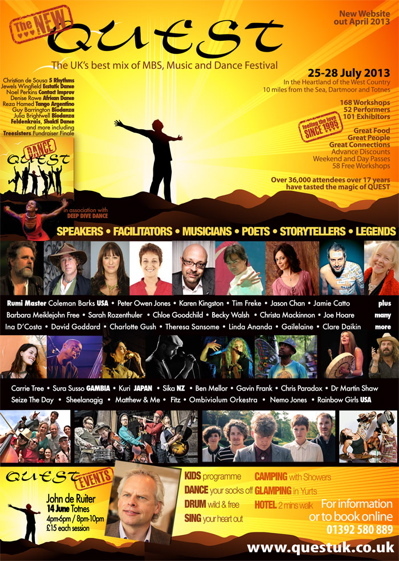 We haven't got more information the festival yet . I'll tell you when I get it. KURIステージ出演／２３日（土）Afternoon in Small world main stage.